MexConnect.com Forums: Specific Focus: Mexican Kitchen: How come proper Mexican gets so 'lost in translation' so to speak when it gets to Europe? How come proper Mexican gets so 'lost in translation' so to speak when it gets to Europe? I just can't figure that one out. Mexican food is put on UNESCO heritage list and yet all it means in Europe is, well, Tex Mex mostly. There are some proper Mexican restaurants but people don't really seem to realize the difference between that and the stuff they sell in major supermarket chains (stuff from Old El Paso such as nachos, enchiladas, fajitas and all that). They even believe that genuine tortillas are all like 30 cms diameter and made of wheat. It's worth mentioning that you can get proper ingredients but they're very expensive and not widely available. I think it's a shame that Mexican food is mostly regarded as comfort snacks that come in colorful boxes decorated with little pictures of chilies and cactuses. No wonder why this guy from Top Gear referred to it as "sick with cheese" if all he's ever experienced is the stuff from Discovery Foods and Old El Paso (sorry but that's really what the dishes end up looking like once you finish cooking them). Ignorant? Yes. But, how to make proper Mexican more widely available? Why does it continue to live behind the shadow of Tex Mex comfort food? If it is any consolation, it gets "lost in the translation" crossing the border into the US too and that includes all along the border States. And they just announced that according to the most recent census, we have more people of Hispanic heritage than Anglos. Although true, regional variety Mexican restaurants are cropping up in the U.S., they are still far and few enough to acquaint most Americans with anything other than Tex-Mex (or in New Mexico, New Mexico style – which is really just another Mexican regional variety from the past, rather than being related to Tex-Mex). There is a very big difference between the "real Mexicans" and the large number of "Hispanics" in the US. I don't have any idea of the percentage of Hispanics here in NM who have never been in Mexico but if I had to take a guess, it would probably be 60 to 70%. You make reference to Tex-Mex, we have New Mexican, Arizona and California both have their adaptations and often the only correlation between these styles and true Mexican is the decor and the fact they serve Mexican cerveza and some lousy tequila based drinks. It is is hard to mess up the cerveza but when they use "gringo tequila" and the wrong kind of limes, a good margarita is very difficult to find. Americans and Hispanics eat at Taco Bell, Del Taco and other assorted large and small chains. I can honestly say that with few exceptions, the food that we have found in restaurants throughout Jalisco, Michoacan, Zacatecas and Guanajuato is hands down the real deal and nothing I have had north of the border compares! What would be the price for a hand made tamal (tamale) in London, England or Vancouver, Canada? Haha in England at least I would say priceless because they're so rare and hard to find! I only know of one restaurant that does proper tamales in London (they're tiny though) and it's 5.40 pounds (about 9 USD) for two (chicken mole, rajas and cheese or pork with green salsa). what a deal! They are 18 euros in a small Mexican restaurant in Paris. Wonder why Mexican food is not more popular? chinagringo, Although I agree with you that Cal-Mex and Arizona-Mex are just regional U.S. gringo adaptations from Mexican food, I lived in New Mexico nearly my entire life and believe me, true New Mexico cuisine is another regional cuisine of Mexico (or should I say of New Spain). It definitely is NOT a gringo adaptation of any specific Mexican regional cuisine, even though it is, to a small extent, echoed in the cuisines of Chihuahua and Sonora. Saying that ONLY the cuisines of Jalisco, Michoacan, Zacatecas and Guanajuato are the ONLY true ("real deal") is very definitely wrong. You're not even mentioning the entirely different cuisines of Oaxaca, Puebla, the Yucatán peninsula and the Maya highlands. There is a very big difference between the "real Mexicans" and the large number of "Hispanics" in the US. I don't have any idea of the percentage of Hispanics here in NM who have never been in Mexico but if I had to take a guess, it would probably be 60 to 70%. . I lived in Dallas, Texas for over 30 years and I , and many others, if we were looking for Mexican food, we went to a restaurant ran by Mexicans. Doesn't anyone realize that Texas and the Southwest WAS part of Mexico. Mexicans have been there before the Anglos arrived. I have eaten some slop in (the real) Mexico that made me wish I was back in Texas in a Mexican restaurant, own by people of Mexican decent, cooked by them and located in the barrio. It sounds like many of you never got out of Taco Bell when you were NOB. I did a very poor job of defining! When I specified the areas, I only mentioned the areas we had been exposed to. The other areas that you mention are on our future "hit list". As far as NM goes, I am so sick of "red or green"! Here in Albuquerque, I could probably count on one hand the number of brick and mortar restaurants that even attempt "real Mexican food" and then use the other hand for the "taco wagons" that make an honest attempt. They are just clueless about true Mexican soul food! chinagringo, you're probably right about Albuquerque (although down in South Valley in the Pajarito area there might be some genuine Mexican food (NOT New Mexican) available, as that seems to have become the area where Mexican immigrants have mostly settled. I know I visited Albuquerque about 5 years ago (maybe 6) and was taken out for a "good New Mexican" meal by some non-New Mexican friends and it was the absolute worst example of New Mexico cuisine I had ever eaten. I'm certain however that in the small towns from Socorro to the Colorado border there are still many, many small, family owned places that serve real New Mexican food. Of course from the worst to the best they all serve decent (at least most of the time) sopapillas, a unique New Mexican treat. Of course from the worst to the best they all serve decent (at least most of the time) sopapillas, a unique New Mexican treat. I'll conjecture that the sopapilla (basically, a small, deep fried flour tortilla) is derived from the buñuelo, from SOB. 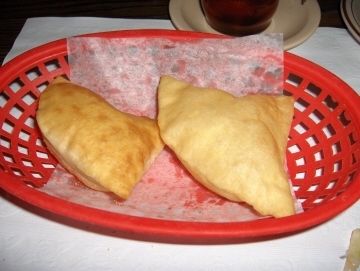 Come to think of it, a sopapilla is very much akin to the beignets of southern Louisiana. There is a very good possibility that our appreciation for the food SOB comes from our "state of mind" but I don't think we compromise our standards or expectations. Those standards or expectations came from years of traveling Mexico before moving to NM seven years ago with high expectations. The one positive that has come from this disappointment is that both of us have expanded our own cooking horizons by learning to replicate those entrees we so appreciate SOB. With a few exceptions, most ingredients can be found in the small Hispanic tiendas located in the areas you mention. So the authentic or traditional ingredients are here, it is more a matter that they don't know what to do with them. I have many of the SOB food blogs bookmarked and they are a valuable resource for ideas and the photos provided give us a standard by which to visually measure our experiments. Anonimo, when you say, "I'll conjecture that the sopapilla (basically, a small, deep fried flour tortilla) is derived from the buñuelo, from SOB. Come to think of it, a sopapilla is very much akin to the beignets of southern Louisiana," you're possibly correct except for the "(basically, a small, deep fried flour tortilla)" thing which is completely wrong, as tortillas de harina don't use any leavening agents under any circumstances. I can't speak about beignets, as I have no experience with New Orleans treats. When you look at the pictures of sopapillas (or sopaipillas) in a Google image search, most of them – from all over Latin America – do resemble buñuelos, but the New Mexico ones differ greatly in they are the only ones that are "puffed" with the hollow center like this photo. That is what makes them unique. The photo is from an El Paso, TX restaurant, but since El Paso is REALLY part of New Mexico rather than Texas LOL, I used it because it was the best photo. thing which is completely wrong, as tortillas de harina don't use any leavening agents under any circumstances. Actually they use baking powder. Corn tortillas use no leavening. I don't think there is another poster that can rival your propensity for posting erroneous information. Bennie, I don't know where you're from, but I have lived in New Mexico and México all my life and NEVER seen (or made) flour tortillas with even a speck of baking powder in them. As a matter of fact, the Sinaloa style ones sold here in Mazatlán are so thin that with the shortening in them they are absolutely translucent, like greased paper. I do have to admit, that from time to time I have had flour tortillas that I suspected had baking powder added (sort of thick and bready), but that hasn't been the norm in my experience. I do see, now that you mention it, that the recipes on the Internet (including one from New Mexico) do include baking powder, but, as I said, it's not how they are made here in Mazatlán and not the way I ever made them. I wasn't trying to pass erroneous information, just what I knew from personal experience. (23/03/11) FYI - I just checked a commercial package of flour tortillas here in a "Super", and the ingredients were Wheat flour, vegetable shortening, iodized salt and 0.1% sodium propionate as a preservative (all in Spanish of course). Not a hint of baking powder here. Joaquinx, I agree with you. We lived in Waco, TX for over 20 years and now live in Bucerias, Nayarit. There are places in Waco which I would love to have here. And, sadly, as you say, there are places here that are just not very good. BTW, I have very rarely eaten at Taco Bell, maybe 3 times ever. Go to the US, Canada, the UK, or really ANYWHERE abroad and walk into a Mexican restaurant: what do you see?--exactly: bright colors, yellow taco shells, lots of cheese, pictures of cacti, and so on. It's those emblematic (even if barely true) little stereotypical things that people latch onto as"Mexico", that get repeated again and again because they're so universally recognized as Mexican. Now go to Mexico and walk into a restaurant. What do you see?--exactly: none of that crap. The colors aren't bright or vibrant; they're normal, down to earth kitchens and little eateries. The food isn't over the top with spices and cheeses and all flour and 30cm baking soda tortillas; it's sensible, reasonably portioned dishes that use ingredients for taste, not just for presentation. I could go on and on. Authentic Mexican tastes better, but it's a lot more low key, and low-key doesn't work well as a marketing strategy. So what happens when some guy up in the US wants to open up a Mexican restaurant so people--who have never been to Mexico in all probability--can taste something different? Right: he emphasizes the exotic, almost alien corners of the cuisine because that's what's going to catch people's attention and bring them into his place. Multiply this dynamic again and again, and you get to where we are today, to where most people who have never been to Mexico and tasted real Mexican food have only ever experienced "Tex-Mex" cuisine and believe o tn some level that Tex-Mex = authentic Mexican. It's kind of frustrating, but it makes sense. Cooking authentic Mexican recipes, be it tacos, Mexican beans, or any dish for that matter, is sure way to put a smile on your guests' face.